I recently got a good question from Aruni Gunasegaram, asking how to import posts from her blog into her Facebook profile. I look forward to learning more about facebook from your blog. I really need a crash course. The problem for me and the social networking sites is that there is so much information out there that trying to learn it all while at the same time launching a high-tech business is not proving to be very effective. I guess I’ll just learn as I use it! Some things about facebook are intuitive and others are not. For instance, how do I add my RSS feed for this blog to my profile? I’ve seen a few other people who have done it, but I haven’t been able to figure out how to do it myself yet! It’s pretty simple, and I actually do it in two ways. The first is through the WordPress application for Facebook (since my blog is on WordPress.com), but here is the more generally applicable method that will work for you, no matter what blogging platform you’re using. Here’s the full explanation for how you do it; the shortcut version is in the next paragraph. In your Facebook provile, in the left navigation, click more to see all of your applications, then click the Notes application, and in the right side click “Edit import settings” under Notes settings, and you will be able to choose an RSS feed to import into your Facebook mini-feed. The top half is what is imported directly by the method I describe above, while the lower half is what the WordPress application does. This is a really helpful way to keep your Facebook profile fresh with a minimum of effort. 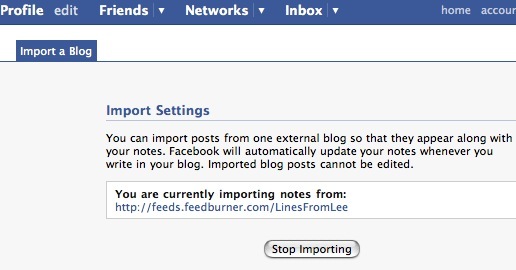 You can focus on writing for your blog, and let Facebook’s automatic import feature post it to your profile. The beauty of Facebook is that it makes connecting with people easier. The last thing you need is to have to take time to enter the same information in multiple places, or to remember to post a new blog post to your Facebook profile. Hopefully having this tip will help you automate what you can, which will free you for the more interesting and higher-level interactions you can have in Facebook. I never knew you could do that–and now, thanks to your easy-to-follow instructions, I’ve imported my blog into my Facebook profile. Thanks so much for sharing the tip, Lee! Thanks Lee! This is great! Is there a reason to do both or is one method preferred over the other. I went to the WordPress link you had above and started the process but in the pull down with the listings of blogs, nothing was there. I’m sure there is a place to add your blog within Facebook but so far the only place I saw was a section called Websites where I listed both my company site and my blog site. Glad I could help, Lisa. Aruni – I think the WordPress application only works for blogs hosted with WordPress.com. The only reason I did both was because WordPress developed the application, and I did that first. Then I found out that Facebook lets you import a blog directly into Notes. Unless you are using WordPress.com, I would stick with the second method. Just click the link below, and you will be able to import your blog’s RSS feed.